Situated on the beautiful Bay of Plenty Coast, between Whakatane and Papamoa, with just a short stroll across the road to a white sand beach and the sparkling blue Pacific Ocean - a popular surfcasting mecca. Our Pikowai holiday home is a great place for families or groups to relax and enjoy. The home is an older style house - an original farmhouse built in the 1950's with five bedrooms (2 rooms have their own small ensuites), a main bathroom and a choice of living areas, the home is spacious with a large outside area to enjoy, explore or play. It is situated on an elevated section so you can enjoy stunning views out to sea. Relax by the pool, cook up your catch on the BBQ and help yourself to our fresh produce in the orchard and vege garden. A Surf Casting Rod is provided for your use. Please BYO bait. In the surrounding area enjoy the abundance of activities the Whakatane district and the Bay of Plenty has to offer including: fishing charters and big game fishing, mountain biking, dolphin and whale watching, white island active marine volcano tours, delish Berry farms, white water rafting, stunning beaches, horseriding, beauty therapy, hot pools, walks and tramping, surfing, paintball, shopping, golf and so much more! Situated between Whakatane (20minutes drive) and Papamoa (30 minutes drive), there are a multitude of places to visit or get your shopping fix if you wish. Smart TV in main lounge (Freeview, and you can log in to your own subscription of Netflix/Lightbox etc), youtube. Smaller TV connected to DVD player in 2nd lounge. What a lovely place to enjoy a family getaway! We stayed over during the Oxfam Trailwalker weekend. Although it was a short stay it is the ideal size for a family getaway with all the necessary creature comforts. The view of the sea from the dining room table and the bay window is stunning. We even had fresh figs from the very big tree in the garden! A highly recommended place to stay if the family wants to explore the district and come back to a peaceful place at the end of the day. We loved our stay. The house is large and really well equipped, with lots of areas for young children to play. The pool is awesome and the orchard a real treat! We’d love to come back again. Magic spot along Matata straight, private and secluded. Definitely would stay again. This was our very first trip to New Zealand, and what a wonderful trip we had. One thing that made this trip so wonderful was the beautiful home we had to rent for a week. The home was quaint, clean, and perfect for everyone in our group to spread out and have their own space. Another plus was the sweet couple (caretakers) who lived in the back yard in their own separate home. It was nice to know they were there in case we needed any help or questions answered. They were always very accessible. We are the type of people who like to stay in and cook our own meals when traveling, the kitchen was very workable, and was stocked with many items that helped to prepare our own meals. We also travel with a toddler, and there were toys, and books for him to play with and keep him occupied. The beds were amazing, and so comfortable after a long day of traveling/site seeing. Lastly, the location was absolutely gorgeous. It's located at the top of a small hill over looking the vast ocean. There is green grass to run and play on, and the pool was an added plus. My one little concern/complaint is that it wasn't really a place to let a toddler run around alone, and someone needed to be with him at all times. I wouldn't even say that is a complaint! The pool is locked up and completely idiot proof - so much so, that we had to walk to the caretakers and ask for help to open the gate. But that is a good thing! The location is very close to the city of Whakatane, but was a bit of a drive to other hot destinations throughout New Zealand. 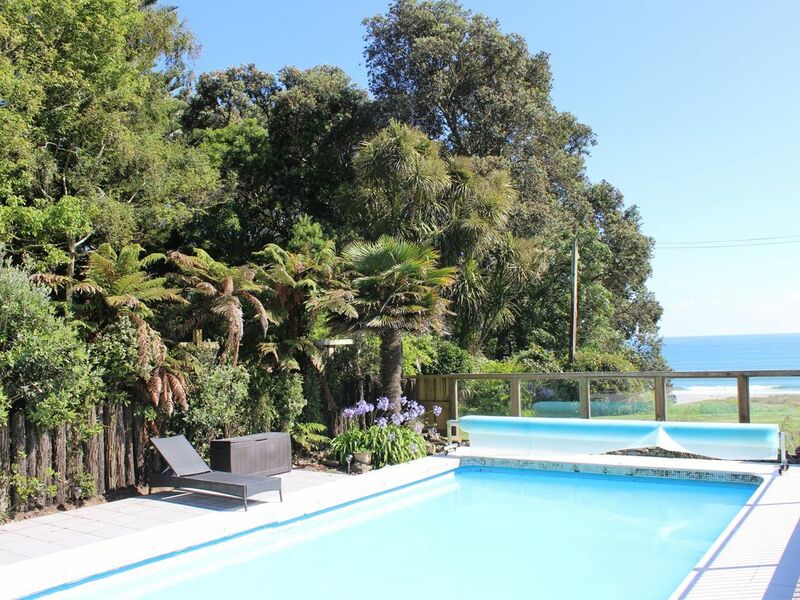 If you are just staying on the east coast of New Zealand then this is the house to rent. It truly was a home away. And a home away from the bitter cold we have this time of year in America. If we ever get back to the north island this will be a place we stay again, and again. Thank you so much for opening up your sweet home, we truly enjoyed our time here. Our extended whanau had an awesome stay, room for everyone, grand kids loved the pool. It was very handy & helpful having property caretakers nearby. The house was as advertised.